This is an intelligently-written course that deals quickly with the general theory of automotive electronic systems and then goes about informing how to diagnose and treat (I mean repair) both simple and complex electronics components that are vital parts of the nervous systems of a number of brands of very popular off-shore car brands. This new and latest edition in Bentley’s Hack Mechanic series … “European Automotive Systems”, true to its title, deals with the mysteries and (sometime) madness of the electrical systems of cars imported from the Continent. Thorough, surely scholarly, but still written in understandable terms, and with an almost uncountable (every page) wealth of sharp, understandable diagrams, photos, and charts … this book is (almost) fun to read, even if it is only to try to better simply understand what’s going on under the hood of your car and not necessarily to trace problems down and fix them oneself. Like a book on medieval warfare techniques and technology, or the ins and out of brain surgery, this book can easily be read just for the information … Knowledge is (pardon the pun) power here. You KNOW that your car runs on gasoline, right? You’re quite aware of that at the pump every time you fill your fuel tank up and slide that pair of twenties across the counter or swipe your credit card in the slot. (By the way, if your European car or truck is a hybrid plug-in all-electric, go on to the next book review here. On the other hand, if it relies on an internal combustion engine, stay tuned…). OK right, that running on gasoline question was bogus. Your standard car, truck, and/or motorcycle all need highly complicated electronic systems, not only to run and control the motor and automatic transmission, but to see to a huge number of your needs and desires, from sun/moon roofs to 20-way adjustable seats, and on to NAV systems and super-vigilant safety systems that guard and guide the vehicle as well as providing protection in collisions and crashes. 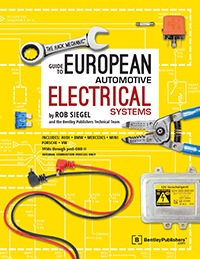 This book is most assuredly not for everyone, even though it’s written in some of the clearest and easiest to understand language, not everyone is all that worried about the electrically system(s) in their cars. This book is the one that 8 out of 10 people reading these words will never even crack … but those two, the ones who this book is for, can be very important to the rest of us. And that’s the idea here. This is an intelligently-written course that deals quickly with the general theory of automotive electronic systems and then goes about informing how to diagnose and treat (I mean repair) both simple and complex electronics components that are vital parts of the nervous systems of a number of brands of very popular off-shore car brands. My theory was that well past half of the books that we had that pertained to doing some specific task (let’s say your own plumbing, or re-roofing your house, or tracing down a short in your car’s wiring system) were often, and in fact, how NOT to do it books … in their use in informing the reader of the degree of difficulty of a certain task. Readers were apprised of the how complex a job was and often (after assessing themselves) went with professional help. Like the books in the LA County Library system, this one is very good at separating the adept from the less adept. And especially the less adept who understand that they really do not have to be able to re-wire their twelve year old Audi in order to be fulfilled, and who understand that far more clearly because they looked at the process in this book and said: “Pass … let’s get a pro in here.”, which sometimes is the smartest, most efficient, least expensive, and safest approach to a serious automotive electrical problem. One feature of this electronic textbook is the author’s very informative information on the dangers of working with electrical devices. By now, I’m going to guess that we’ve all felt the vibrating sting of an electric shock. Since you’re reading this, I’m going to guess that the shock did not wipe you out, but author Siegel is very careful to explain that a nasty shock CAN be very bad (life-threatening in many cases) and that caution and common sense is the only pre-antidote for this one. His warnings here are clear and correct. And (aside from a radio not staying on station, or a CD getting stuck in the player) most modern automobile electrical problems are just that, serious. There may be sufficient gasoline in the tank, but if a very long list of electrical signals aren’t followed precisely to the letter, and dozens of minute connections aren’t made exactly on time and in a very precise order, in the words of Bob Dylan, “… you ain’t going nowhere”. Even if one never calculates a compression ratio, figures optimum gear ratios, wants to talk a few basic kinematic ratios, get heavily involved in spring rate calculations, or figure out the precise center of gravity of their racing car, this remarkable 604-page masterclass in (playfully titled “Physics for Gearheads”) will give its reader a sharpened appreciation for and understanding of a branch of science that can be almost mistaken for an art. Hey … Gearheads! … Did you see that first number above? 604 pages, RIGHT, six hundred and four pages (count ‘em!) of first-rate, hard-core, right-up-your-dragstrip (or front straight) highly-useful technical information that reflects equally on the causes and the effects. Name a component of high performance motorsports: horsepower, handling, roll, traction, braking, aerodynamics, friction, spring rates, slip angles, and every other immutable dynamic laws or forces that racing machines do their work under, and you’ll find page after page of interesting, informative, and understandable information. Maybe even a bit more than you were looking for, but this is not really a line-by-line, page-by-page, cover-to-cover book. Open it up, look around, find an illustration that grabs your eye, and dive headfirst into the amazing physics of performance. There’s information here on what it really takes to go Supersonic at Bonneville with a speed against time chart on page 156 that spans exactly 161.7 seconds and shows Richard Noble’s sound barrier-busting run from zero to 1,138 feet per second (about 778 miles per hour) that found him fully 13 miles away from his starting point a short 2.695 minutes later. …Maybe you want to talk about the perfect line around an oval track or a road course, as you might suspect, it’s all about physics and Doctor Beikmann has the numbers and the formulas. And, his new book will show you the way to calculate that and a whole lot of other very important bits and pieces of the full performance envelope that that racers flat out need to know and that gearheads of all varieties are going to have a lot of fun learning about. Math was always my worst subject in school, but I still grew up a car nut, a racing nut, and someone who has fought to get all my sums right all my life. I only wish that I had had access to a book like this that really puts math (and physics) into direct a direct, working, logical relationship with motorsports. Much the electronics book we looked at earlier on this dual review this one will be a book that, if nothing else, will help its reader to far better appreciate the art and science of the subject, in this case motorsports. Every time that I get into an automobile, I almost instantly forget my own counsel and think that all you really need to do to be a racing driver is hold the gas pedal down a little harder for a little longer… of course that’s not the case, but everyone drives and everyone THINKS that’s all it takes. Take it from me, it doesn’t. Same thing happens with racing cars, they (generally) work so well and go so fast that a lot of the hard work behind the horsepower and the handling is just taken for granted, and the driver gets all the glory. PERSONAL ASIDE: I can’t imagine that one of the engineering schools (Cal Poly SLO … are you listening?) wouldn’t want to offer introduction to racing physics course using this book as the basic text, it would be a great way to excite, encourage, and really teach a large chunk of the basics of motorsports.